Well here's a powder keg of a book. Let us start with a quick summary of what it is. In 2003 the poet and writer James Lasdun was teaching a fiction workshop at 'a place I'll call Morgan College.' Among the students there was a woman 'I'll call Nasreen.' Lasdun praised a piece of her writing in one class and after the course ended an email correspondence began in which Lasdun hoped to help her in some small way with the novel which she was writing and also he hoped to maybe make a friend of someone he found interesting and different. So far, so innocent. Or is it? Lasdun is at pains in the opening chapters to examine his behaviour at the outset because what developed was a prolonged campaign of obsessive emails, abuse and cyber-bullying in which she tried to besmirch his name and character in a variety of ways leaving Lasdun himself not just shaken and confused but ill as well. The book is peppered with excerpts from these emails (Lasdun aware of the irony that in quoting so freely from this private correspondence he is behaving in exactly the way that he so deplored in her when she copied other people in on her own emails to him and used the public sphere of Amazon reviews and Wikipedia entries to further muddy his name) which start off friendly and funny, gradually becoming amorous and slightly inappropriate, before becoming suddenly vitriolic, violent and filled with hatred, anti-semitism and delusion. These emails are as baffling for us to read as for Lasdun, if not as personally upsetting. They also caused me a certain amount of unease. Firstly that they were obviously selected from a larger body of correspondance; then that they were often quotes or excerpts and one wondered about any possible context within the rest of the email. Jenny Turner in her Guardain review said that this is a book plagued by too much information and also at times not enough. It was the not enough part that concerned me most. Taken at face value this book makes clear that this was a campaign of 'verbal terrorism' that Lasdun suffered. The reasons for Nasreen's behaviour are never satisfactorily explained and Lasdun even prefers not to think of her as being mentally ill but someone motivated by a motiveless malice. But how can we not regard her as someone clearly suffering from some kind of mental distress? We just don't know enough about her from this one-sided account of course, and I don't say one-sided in a purely pejorative sense - what else could Lasdun write, however balanced a writer he may aim to be, when attempting to tell such a fraught tale and one in which he is implicated? Reading this as an account of something with a quasi-legal standing (we feel as though this is in many ways a book about a crime being comitted, a book with a victim, protagonist and law enforcement officers) makes for a lot of frustration, Nasreen cannot defend herself and even if we accept Lasdun's inference that she couldn't add anything of any value we can only do that if we accept it all. If it doesn't quite work as a book of true crime then there are two other ways in which it potentially succeeds. The first of these is probably closer to the way the book is being sold: as a memoir. Lasdun uses this event to write about several other works of literature (you may never need to read another book about Gawain and the Green Knight for example) that illuminate the experience and these sections are fascinating, lucid and wonderfully written. There is another riskier suggestion, a million miles away from the way in which the book is being marketed and that is as a piece of extraordinary experimental fiction. I drop that here merely as a catalyst for discussion, it was something that came up during a little conversation of Twitter the other day, and whilst it may not be true it certainly adds a completely different way of approaching what is an interesting, complex and very troubling reading experience. 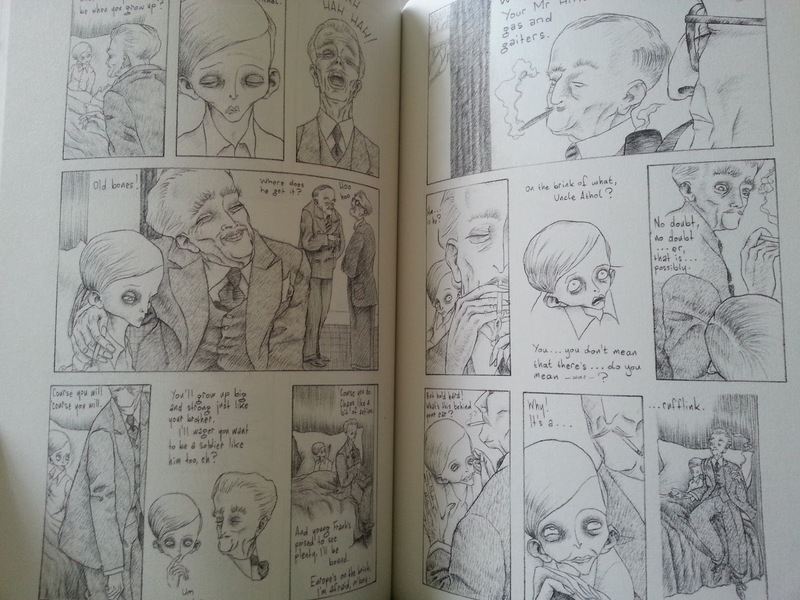 This debut graphic novel from cartoonist Steven Harris may have some colour on the cover but every page inside is black and white, or rather the many shades of grey in between thanks to his deft and detailed pencil drawings. Eustace is a sickly young boy, exiled to a lonely room in a large house where he is really only visited by the maid, Mrs Perichief, each day as she brings him his stable fare of soup ('not even any kind of soup, just "soup". It's thin and yellowy like old skin.'). Through the novel however he is gradually visited by an ever-growing array of grotesques, beginning with his dreaded great Aunts with their sloppy kisses and secret gifted sixpences. What exactly is going on in Eustace's family is never fully clear although we gather there is some trauma related to his brother Frank, who served in the Great War. Eustace's mother makes a ghostly appearance, ravaged by life, and his father even stumbles into the room, barely able to recognise the son he never sees. It is the sudden appearance of Eustace's uncle Lucien however that really gets the party started and Eustace's bed becomes the focal point of a congregation of crazies whilst all the while in the background is the hint of something dark and dangerous in Lucien's past that is slowly closing in on him. To my mind Harris's drawings combine the long lines and monochrome of Aubrey Beardsley with the sunken-eyed macabre of Tim Burton. There is something feverish or nightmarish about the procession that passes through the room and one wants to constantly put an arm around poor Eustace and sneak him away somewhere. There is nothing we can do however to protect him from the novel's surreal and comically absurd ending. It's been a while since Kent Haruf featured on this blog but then it's been a while since he wrote anything, almost ten years in fact since he last wrote about the residents of his fictional town of Holt in Colorado. You can read my thoughts on Plainsong and Eventide and imagine my excitement when I heard that he had written a new novel that would take me back amongst those familiar faces. I was worried I might need to familiarise myself with the previous books but his new novel stands alone and in fact has little to do with any characters from the previous books. The main focus is on 'Dad' Lewis, owner of the hardware store, who receives the news that he is sick with cancer and has just a few weeks left to live. We will also follow the descent of the new preacher and the way in which the women of the town envelop a young girl without her mother but it is Dad Lewis who forms the novel's heart and around whom the people of the town will congregate. The surprise is that about a hundred pages into the book I wasn't sure that I wanted to carry on. I'm so glad that I did. 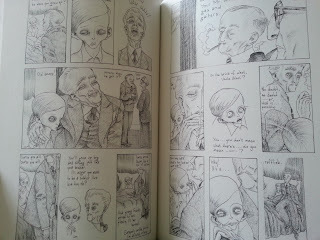 Haruf's style is deceptively powerful you see. The prose is simple for the most part, the speech direct, the situations fairly everyday, we observe along with the new preacher 'these everyday lives', but what builds inside that structure is a wave of emotion that overwhelms the reader as the book progresses. There are moments that edge toward the melodramatic and the whole novel flies dangerously close to sentiment but in the central story of Dad Lewis in particular you have a sensitive, truthful and painfully affecting story of life, work, relationships, family, alienation, ageing and mortality; the stuff of life in other words. The way in which it manages to combine both the dignity of the way we behave with the indignity of the way our bodies betray us is masterful and there was at least one occasion when I was powerless to stop the tears welling in my eyes. How refreshing to come across a novelist who allows the characters to tell the story instead of forcing a plot onto them. This sounds like worth looking out for!